Time’s running out before we have to make our decision on the EU referendum in June. So what does the UK manufacturing industry need to consider before voting? We take a look at the key points for and against a vote to leave the EU. 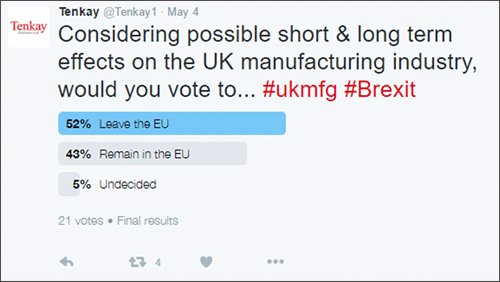 We conducted a Twitter poll last week to get an idea of how many of you wanted to leave or remain in the EU based on the short and long term effects on the UK manufacturing industry. The result? It looks like we’re still split down the middle with 52% voting to leave the EU vs 43% voting to remain and the remaining 5% being undecided. Are you surprised by these results? Let us know on Twitter using #ukmfg #Brexit. A vote to leave would require new deals to be negotiated not only with the EU, but with non-EU countries as well. The Office for National Statistics shows that in 2015, exports of goods and services to the EU accounted for 44% of the total exports. The share of exports has fallen by more than 10 percentage points over the last 15 years. Between Quarter 4 (October to December) 2015 and Quarter 1 (January to March) 2016, the UK’s trade in goods deficit with the EU widened by £0.7 billion to £23.9 billion – the widest on record – reflecting a 1.6% increase in exports and a 2.3% increase in imports to £57.5 billion. Exports to non-EU countries increased to £12.3 billion and imports from non-EU countries increased to £47.1 billion. So how easy will it be to continue trading with EU markets if the UK left? With bigger exports to the UK than imports from it, how difficult are these existing markets likely to want to make continued trading with the UK?